Hi, my name is Mario, and this is the devblog of GOHR. GOHR is a low fantasy hack and slash game, so keep your elven tights and magic tomes at home! This is the age of fur pants and steel! Below you can watch the announcement trailer of GOHR and some prototype videos. On March 28 I will present the prototype in public on an event called Talk and Play. It is located in Berlin. I will post the Talk and Play version here as well. Please keep in mind it is only prototyping stuff. As soon as the Talk and Play version is finished I will post it here as well! Chests, potions and drinking potions. The prototype of GORE's core mechanic is done. If you are living in and around Berlin you will be able to play this prototype at the next Talk and Play. Here is some new footage! This time it's all about climbing ladders! Enjoy! Here is the combat footage along with the trailer, concept art, and head studies of the main character. GORE is also a concept on Steam Greenlight. New Footage. This time it is all about ladder climbing! Enjoy! Your Trailer is quite impressive! Currently working on "Roguelite Platformer with Online Coop"
I don't know if this is just me, but it looks like as I am only able to have two video links per post. At least I can only see two videos in my initial post. So here is the video of the combat prototype. Moreover, I will prepare my Twitter account as well. Woah that black and white concept art is very cool! Are you planning to stick with the textureless models? It looks very stylish. 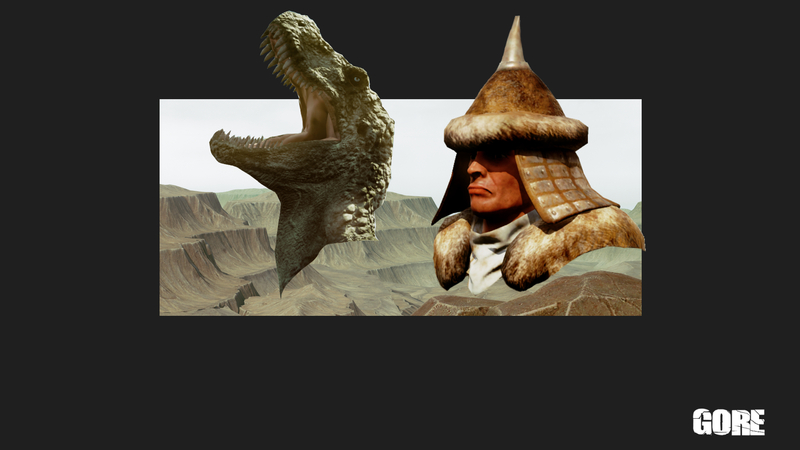 The Models will have textures in future. What do you think? What would you like more? Black and white? Comic book style like my head studies? Triple bull*** like EA and Ubi?.... Sorry, I meant: AAA like EA and Ubi? I am mostly inspired by old school stuff like Frank Frazetta and old school paleo art from Burian or Knight. I don't like the AAA approach, where everything is kit bashed or copy pasted together. In the beginning it was kinda cool and believable, but then it exploded and suddenly simple castles or temples became epic and giant superstructures. In a nutshell: I try to keep things simple and avoid what I call "Uberdesign". This was the very first time in my career where I show my very own game to a larger audience in public! Great to hear you have a simple design ethos. I too am tired of 'overdesign' that seems to plague AAA. Don't get me wrong- I like flashy things but it does reach a point where it becomes un-believable. plus if a game starts out by bringing out the big guns - it has nowhere to go, later levels/areas have little capacity to impress, which is a conundrum in itself, and probably the reason level 1 from (insert game) is the best level in the game. There are exceptions of course (Bayonetta starts pretty wild and goes to ridiculous levels). I am about to create a survey. I'll launch it on Saturday. It is also about the art style. Here are the the two pics regarding the art style. 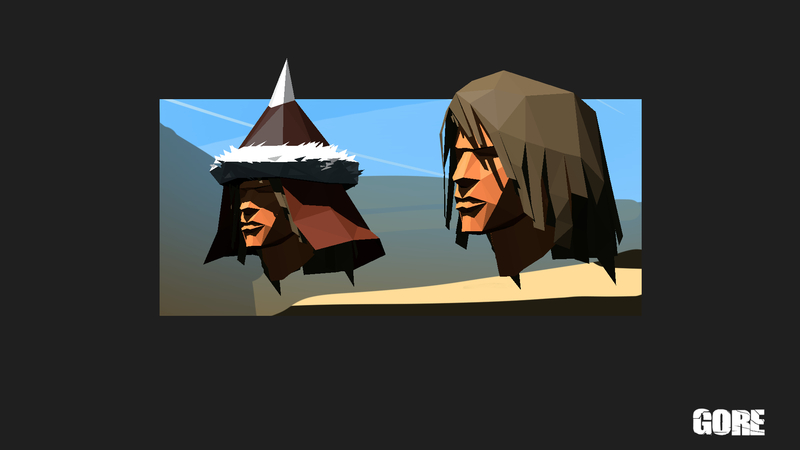 Nr 1: low poly and more stylized. Here is my small questionaire regarding GORE. Please help me and fill it out, if you find some time! Thanks a lot! Hey, friends and followers! Here are the results from my questionnaire! It was a devastating blow for the name GORE! I am pretty happy with the result! I was also very surprised that many of you really loved the title GOHR and valued it as equally powerful! The art style was a close race! The high poly style received a lot of love but because many of you equally liked the low poly and the hi poly style the low poly style made the race. Thank you all so much for helping me! Also big thanks to those who didn't like the questions! Your critiques helped a lot!